Hot Pepper Bacon Popcorn with a Lindt Chocolate Drizzle. 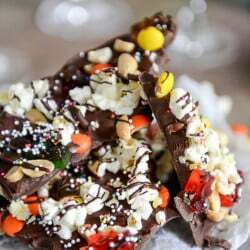 Movie Theater Candy Chocolate Bark. Smoky Bacon Popcorn with Burnt Sugar and Sea Salt. White Chocolate Lavender Vanilla Popcorn.